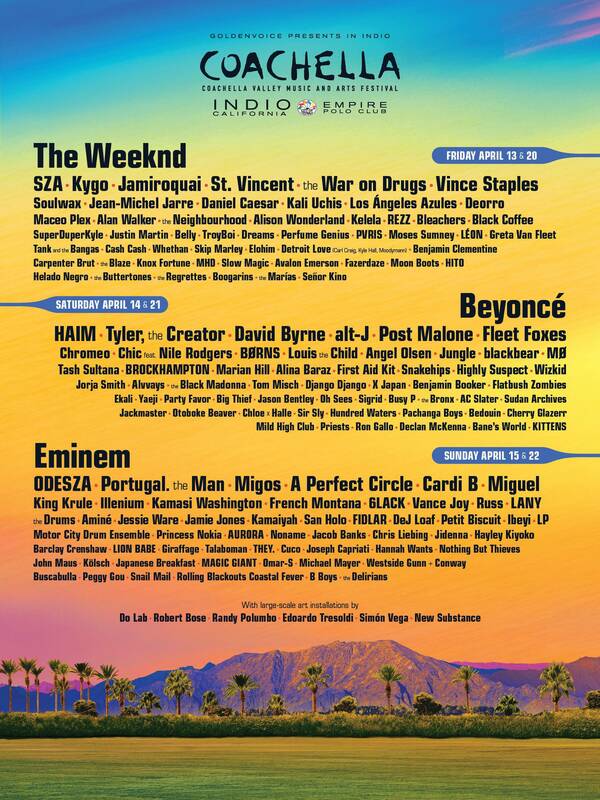 Coachella’s first weekend kicks off this Friday 13th April. Over the course of two weekends – 13th to 15th, 20th to 22nd – the festival’s enormous line-up is being headlined by Eminem, Beyoncé and The Weeknd. The massive California festival has now announced its live stream set-up for the first weekend, which will run over four channels on its YouTube channel. The newly added fourth station will be a 180-degree virtual reality stream from the Main and Sahara stages. The virtual reality channel can be accessed using a VR headset. Among the 75 confirmed acts to be streamed over the weekend are the likes of Alan Walker, Alison Wonderland, Beyonce, The Weeknd, Ekali and ODESZA. Also on the festival's huge line-up are the likes of Maceo Plex, Jackmaster, Jamie Jones, Kelela, Black Coffee, Hannah Wants and Omar-S. Check out the full line-up below.